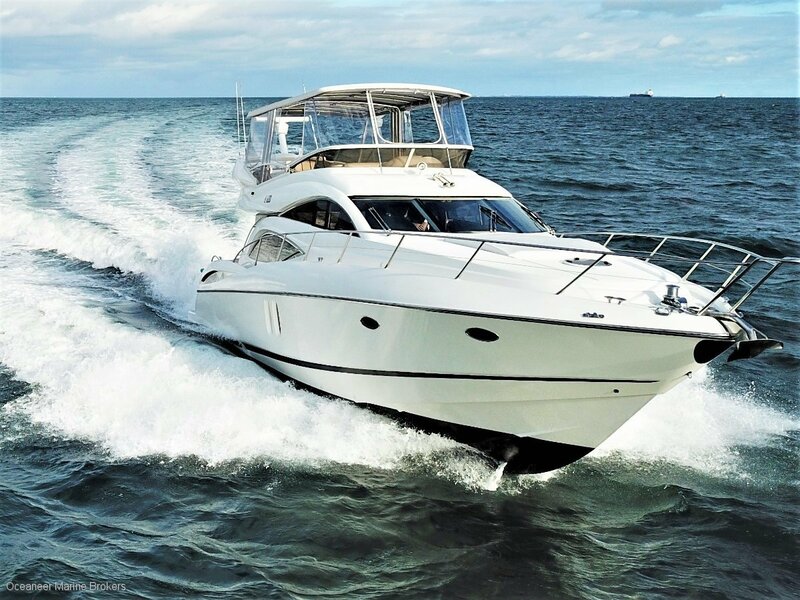 Manhattan 56' – powered by twin Caterpillar 3406 Diesels. Luxurious boating with fantastic modification and updates to the sundeck and bimini. This Manhattan boasts a custom full length hard top bimini propped up with exceptional stainless steel stanchions, surrounded with new clears. Flybridge is well-appointed including BBQ, fridge, icemaker and sink. Sunseeker quality and highly specified finish throughout the vessel provides a glamourous European feel. Family and friends can be entertained in complete comfort with multiple areas to dine and relax. Fully equipped galley, stepping up to saloon deck and helm station. Accommodation areas include full beam master cabin with spacious ensuite, VIP cabin forward with bunks and guest head to Starboard. Full a/c system, Raymarine electronics package, electronic controls, bow thruster. True Sunseeker pedigree and performance. Inspection will impress. electronicsRaymarine echo sounder - GPS - Plotter and radar. Simrad auto pilot, radio and stereo.